The other night I had no idea what to make for dinner. I had some leftover lentil salad that had been delicious but looked a bit cold and tired. I also had two nice boneless chicken breasts. I thought, “how about spicy chicken and lentils?” Like a non-Asian stir fry. And that is exactly what I did. I started with some olive oil in a pan and heated it to medium. I then cut the chicken breast into chunks so it would cook faster and more evenly in the stir fry. I seasoned the chunks with some kosher salt, pepper, small drizzles of olive oil and white wine vinegar and a sprinkle of paprika. When the pan was hot enough, I turned it down slightly and added the chicken in. I sautéed the chicken for 8-10 minutes until the internal temperature of the chicken was just around the mark used to judge cooked chicken (165 Fahrenheit). I deglazed the pan with several tablespoons of white wine vinegar, scraping little bits of flavor off the bottom. As the vinegar sizzled, I added three heaping cooking spoons worth of lentil salad to the pan. What was in the lentil salad, you may ask? It was small black lentils, chopped tomatoes, chopped onion and feta cheese mixed with a homemade mustard vinaigrette, salt and pepper. Before even mixing the lentils in I added another tablespoon of Dijon mustard, a little more paprika and some chipotle powder on top. These additions married the chicken with the lentil salad and also added that smoky, spicy kick I was going for. Only then did I mix the lentils, the chicken and all of the flavors together for another minute or two. By then, the chicken had nice color and the lentils were warmed up and looking far livelier than they had in their cold leftover state. The pan made enough for two meals or a little more, so I portioned a nice plateful for myself and then packed up the rest. It turned out to be a delicious little dinner. As random as the dish may have been, the chicken and lentils married together beautifully and they both really popped in the presence of the other and the nice tangy, spicy flavors binding them together. 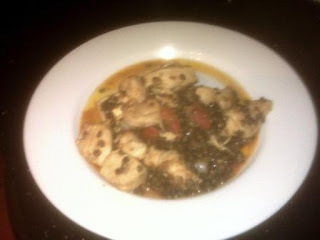 The chicken was juicy, and the lentils flavorful and not overcooked despite their reheating. Of course I could have done this with fresh lentils and fresh lentil salad, and I may in the future, but it's always a small victory for me when I can rebrand some boring leftovers into an exciting and tasty dinner. There's still more lentils left over. And now there's some wonderful chicken and lentils too. I bet you know which one I'll be reaching for first.